Editor's note: This story was updated April 30, 2014. LAKELAND -- When the praise band strikes its first musical chords at the 2014 Annual Conference, the youthful exuberance of the worship leaders likely won't go unnoticed. That is the intention of Bishop Ken Carter and the two young adults he tapped to form a praise band to lead worship at the event, scheduled for June 11-14 at The Lakeland Center. Jeremy Hearn and Michelle Weger, both age 28, were overjoyed at the request. “I'm still trying to figure out how it happened, but it is an honor," Weger says. "I think this is an opportunity for a fresh perspective. But, also the presence of youth in the church gives the older generation a sense of passing the torch." She and Hearn know what a large responsibility they have. As worship leaders at their respective churches, both are committed to encouraging active roles in the church for young people. Weger is worship leader at Grace Church’s Shores campus in Fort Myers; Hearn is worship leader for the contemporary service known as “eleven20” at First UMC, Lakeland. Jeremy Hearn and Michelle Weger perform at the laity session of Annual Conference 2013. The duo have put together a young adult band to lead worship at this year's Annual Conference, June 11-14, at The Lakeland Center. Photo by Dave Walter. "It is a dream I've always had to have the opportunity," Hearn says. "It is much bigger than myself." Among Carter's goals for the conference is to recognize the diversity of worshipers in United Methodist churches - in this case, diversity of age - and encourage growth and leadership among Methodists from all walks of life. He believes that inviting the pair to form a young adult band to lead worship for the 2014 Annual Conference furthers that goal. 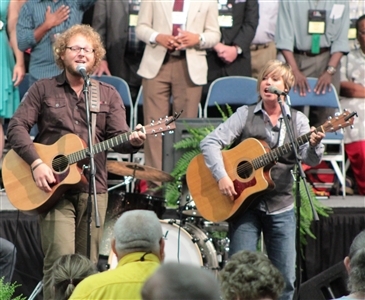 Conference members got a sneak peak at the pair's blended worship and music style at last year's Annual Conference, when Weger and Hearn led the crowd in song at the laity session. Carter first heard Hearn and Weger lead worship services when he was visiting their respective churches. Hearn was then in Port Orange and Weger was at Grace. "I was very impressed and amazed by their musical gifts but also by the way they lead worship," the bishop says. Hearn and Weger have spent the past months getting better acquainted and sorting out just what kind of band best meets the conference's needs. Weger is an acoustic rocker and a sometime piano player with an eclectic mix of favorites, including Christian contemporary artist Chris Tomlin and the pop rock band One Republic. She has recorded a CD, "Embers of Faith," and is working on a new worship CD for later this year. "I like anything that is complex, that has a variety of instrumentation, anything that takes me somewhere in my emotions or thought," she says. Hearn also favors acoustic guitar but added the banjo about five years ago. He plays with his church's 11:20 a.m. worship band and hopes to record a CD in the near future. Scroll down to see a video of the Africa University Choir performing.The choir will sing Thursday evening, June 12, at the 2014 Annual Conference. For more information about the 2014 Annual Conference, click here. He loves Christian contemporary groups such as the folk duo of All Sons and Daughters but also leans toward the "soulful" sounds of John Mayer and Jason Mraz. In bluegrass, he likes Nickel Creek. Blending different music styles might seem challenging, but both performers share a belief in the power of music to heighten the experience of worship. They have a play list for the conference of new, traditional and re-styled hymns and songs. "I think the music prepares and softens people brought to hear the word of God," Hearn says. "It's a conduit. It conveys us in a different way to the Holy Spirit." Weger and Hearn recruited other young band members. Joining them from Lakeland will be drummer Jimmy Patton of Desperation Church; electric guitarist Dustin Barrow of Victory Church, Lakeside Village; and violinist Jennifer Russell and viola player Warren Pattison, both of First UMC. Keyboardist Joshua Smith of Northside UMC in Atlanta and bass player Dave King of Our Savior Lutheran Church in St. Petersburg round out the Annual Conference praise band. Faced with the challenge of band members living miles apart, limited rehearsals have been scheduled around church retreats, including one at Weger's church. But that’s not expected to be a problem. "These are professional and classically trained musicians," Hearn says. "Weekend after weekend, they jump in and play." Weger's faith journey began as a teenager in Florida when she joined neighbors at church services. She served at Mandarin and Van Dyke United Methodist churches in Florida and at a nondenominational church in Illinois before becoming worship leader at Grace Church. She has energized youth programs with pizza and game nights that have attracted as many as 100 students, mostly from a nearby high school. "I am someone who has a grateful, deep love for the Wesleyan tradition ... for what started it all," Weger says. Hearn, who grew up in St. Petersburg, traces his Methodist heritage back several generations. His great-grandfather led a Methodist mission to China. But for about six years, Hearn served as worship leader at nondenominational churches in Austin, Texas, and Nashville, Tenn.
"Youth add forward thinking," Hearn says. "I think that's why, to be real honest, I ran from the Methodist church for a little while." But he says, "When I came back home (to visit family), the Methodist church was really home to me and I really missed it." Like Weger, he is committed to making the church meaningful to young people. He serves as young adult representative on the Board of Lay Ministry and has been involved in other young adult initiatives. "I feel it deep and in my heart to get back involved and get young adults to stay involved," he says. "I'm right in the middle of trying to discover myself. I think there is a lack of cross-generational programs within local churches, a lack of inter-generational discipleship." Annual Conference attendees who like traditional worship music will have an opportunity to volunteer for a choir that will perform at the Service of Remembrance on Friday morning, June 13. Volunteers will be asked to sign up early during the Annual Conference and rehearse selected hymns before the performance. Bishop Ken Carter said he has asked Dr. Beth Gibbs, choral studies director at Florida Southern College, to conduct the choir. Also lifting their voices in song will be members of the Africa University Choir, who will perform at 7:30 p.m. Thursday, June 12, during the “Night of Missions Emphasis.” Check out the video below for a sneak peek. * 2011 performance at the World Methodist Conference in Durban, South Africa.